Rockliffe Hall’s first Festival of Food is underway with a feast of gorgeous gourmet events this week. Kathryn Armstrong joined the chefs’ table to re-visit BBC2’s Great British Menu – and got a sneak peek of a treat in store for diners tonight. When a trio of the North East’s best chefs join forces you know the menu will be an all-singing, all-dancing celebration of dazzling food made for festival showtime. David Coulson, Dan Fletcher and Danny Parker brought impeccable credentials to Rockliffe Hall’s Orangery restaurant last night to host a sold-out dinner paying homage to their BBC2 Great British Menu appearance in 2018. Dave, from Peace & Loaf in Jesmond, Danny Parker, Jesmond Dene House and Dan Fletcher, who started off at The Cleveland Tontine and now cooks at Fenchurch Sky Garden in London, were recreating dishes they had cooked on GBM in celebration of 70 years of the NHS. Dining with us were chef Mark Greenaway, from his eponymous restaurant in Edinburgh and Aaron Craig of The Brasserie at Rockliffe Hall. The six-course GBM menu featured two dishes by each chef. Each prepared with layers of flavour, intricate techniques and a deft, skilled, touch – in their own way every bit as skilled as the NHS surgeons being honoured. First off, Dan F’s duck ham (tea-smoked duck), served with an intense duck tea consomé and served from a teapot, followed by Danny P’s succulent scallop dish with a chunk of lobster on the side and delicious hints of preserved lemons. Dave Coulson’s cod was followed by a dish of veal sweetbreads with crunchy nuggets of black pudding and an earthy puree of it to contrast with the creamy sweetbreads. This dish was judged the dish of the menu by our experts at the table. “Lots of flavours going on here, sharpness and sweetness – lovely”, concluded Aaron. Dan Fletcher then gave us millet-crusted fillet of beef with pretty-as-a-picture slithers of pastel-coloured turnip, radish and celeriac. The menu finished with an exquisite ‘Chocolate’ prepared by Danny Parker. Layered chocolate mousse with chocolate sorbet. The menu proved a huge hit with diners. For chefs like Mark Greenaway, events such as this are a great chance to break away from the kitchen and get creative he says. Tonight he will cook signature dishes for a guest chef dinner at The Brasserie as part of the Festival of Food. Mark is a TV regular and travels the world as an ambassador for Seafood Scotland. Tonight he will be offering diners his own ‘flavours of Scotland’ five-course menu. And, entertainingly, it will feature a tree trunk sprouting with mushrooms. Diners will get scissors and tweezers to chop their own shiitake mushrooms then team them with oozy truffle butter, sourdough and parsley. The ultimate mushrooms on toast. The mushroom covered logs – which have been cultivated for the past four days – will first be barbecued on firepits before they are brought to the table. That’s theatre and then some – and the whimsical way Mark likes to approach his art. “I like to do things like this festival because you actually get to cook with no distractions. It’s great fun,” he says. “It’s a different approach because you are in a different environment, another kitchen, and you have to plan what will work and what you can do. Aaron adds: “I love Mark’s interactive approach to food which mixes simplicity with amazing flavours. * Some places may still be available for Mark’s dinner tonight at Rockliffe Hall. 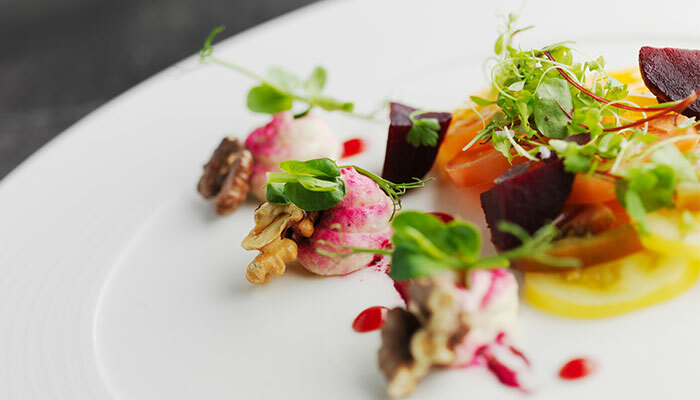 * Rockliffe Hall’s Festival of Food continues until next weekend with a host of dinners, lunches and wine events.